Bake the rolls in the oven for 10 minutes. Meanwhile, cut the pears into quarters and remove any pips. Sauté them in a large frying pan with the butter and sugar for about 5 minutes until they are caramelised, then add the balsamic vinegar and cook for a further 2 minutes. Roughly chop the walnuts then put on a tray and bake in the oven for a few minutes to crisp. Cut the rolls in half and top them with the brie slices. Return to the oven for a couple of minutes to melt. 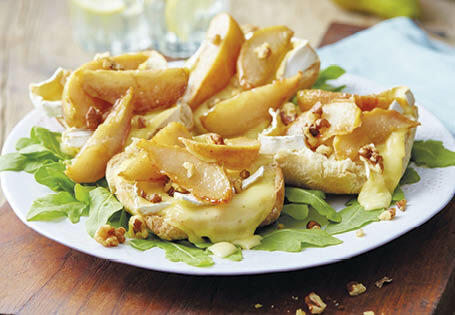 Serve the rolls topped with the pear slices and sprinkle with walnuts on a bed of rocket leaves.